You may also download the signup form or pick up a copy at the Center. Submit to adam@centerfornewmusic.com or in person at 55 Taylor Street. 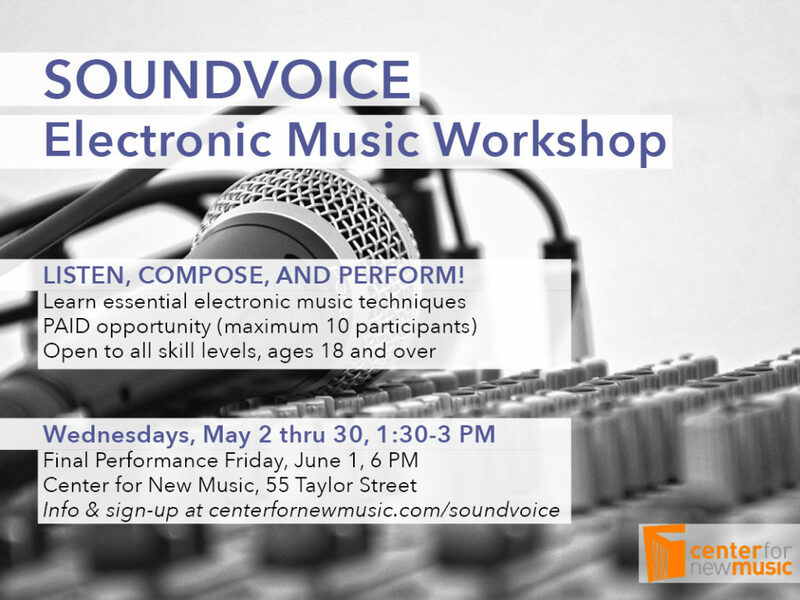 Soundvoice is a five-session workshop in which participants unleash their “sound voice” and inner artist by engaging in the process of creativity held May 2 through June 1, 2018 at the Center for New Music. The workshops explore new electronic music as a way to express personal and community narratives, and are offered to adult residents of San Francisco’s Tenderloin, Sixth Street Corridor, and Mid-Market neighborhoods. The Spring 2018 session of Soundvoice will take place on Wednesdays from May 2 through May 30, with a final presentation on Friday, June 1. Participants who successfully attend all sessions and perform in the final event will receive a stipend of $500. The Soundvoice project incorporates learning, listening, discussion, and hands-on activities. In each session, participants will listen to new music, reflect on what they hear, learn techniques and vocabulary, and write their own music. The group will prepare their new music for a concert performance and celebration on Friday, June 1 with saxophone-voice duo Animals & Giraffes. Each Soundvoice session includes a presentation or demonstration, group discussion, and a hands-on activity. Specific topics for “Electronic Music Workshop” in Spring 2018 include audio editing techniques, field recording, composing for live performers, and more! Soundvoice will be co-led by musicians Matthew Creer and Adam Fong. Creer is a composer and electronic musician. He uses computer coding languages developed for musicians and artists to write pieces for video, often via social media platforms such as Instagram and YouTube. He also performs live computer music and has written acoustic music for performers such as Ryan Ross Smith, Crystal Pascucci and the Eclipse Quartet.​ Creer has been teaching in the music department of City College of San Francisco since 2014. 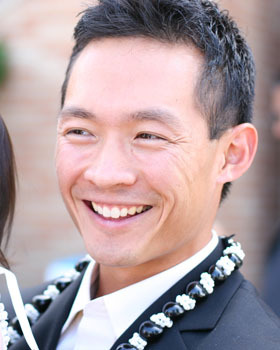 Fong is composer, performer, and producer of new music who has organized hundreds of concerts and festivals, and led special projects including CD releases and tribute concerts of avant-garde and modern music. His own compositions have been performed internationally in Auckland, London, Berlin, Tübingen and Darmstadt, at many US universities, and throughout California. Soundvoice was created by San Francisco Contemporary Music Players in partnership with Hospitality House. The 2018 presentation of Soundvoice is being offered by the Center for New Music, with support from the National Endowment for the Arts.